Human beings are an amazing species. Given enough time, they will multiply, relocate and establish even on the most remote corners of the world. The following islands, I’m sure, were once uninhabited full of lush green forest, beautiful beaches and perhaps with wildlife too. Today, entire cities stands on them. But unlike communities on mainland, land and resources on an island are scarce. With no space to grow geographically these islands are crushingly dense with people and housing. Here is a collection of some of the most populous island in the world. Santa Cruz del Islote is unofficially the world’s most crowded island. It can be reached by an hour’s boatride from Colombia’s Caribbean coast. It has some 90 houses and a population of around 700 people, which can rise to 1200 when the children who attend secondary school on the mainland visit their families. Santa Cruz is surrounded by idyllic waters, but there is no beach, no swimming pools or hotels. The islanders bury their dead in a nearby island because there is no space for a cemetery. They play football on the neighboring Mucura key, because the only public square on Santa Cruz is about half the size of a tennis court. There is currently no electricity on Santa Cruz. The Colombian navy ships brings drinking water to the island, once every three weeks, but that’s not enough for the impoverished population. Women wash the clothes with salty water from a nearby well. And men settle for doing most of their necessities on the surrounding sea. Despite these troubles, Santa Cruz is a peaceful island-village. There are no locked doors here, and at night, dozens of people gather in their neighbors homes to watch popular soap operas. The Hong Kong Island has a population of 1.2 million at a density of 16,390/km², as of 2008. The population is heavily concentrated along the northern shore where the density is 26,000 per km². The island had a population of 3,000 inhabitants scattered in a dozen fishing villages when it was occupied by the United Kingdom in the First Opium War in 1842. The island is home to many of the most famous sights in Hong Kong, such as "The Peak", Ocean Park, many historical sites and various large shopping centers. The mountain ranges across the island are also famous for hiking. Manhattan, an island at the mouth of the Hudson River, is the most densely populated and the oldest of the five boroughs of New York City. With a population of 1.58 million there are 26,924 residents per km², more dense than any individual American city. Manhattan is the third-largest of New York's five boroughs in population, but the smallest borough in land area. Manhattan is the major commercial, financial, and cultural center of the United States. Anchored by Wall Street in Lower Manhattan, New York City functions as the financial capital of the world, with an estimated GDP of over 1.2 trillion and is home of both the New York Stock Exchange and NASDAQ. Many major radio, television, and telecommunications companies in the United States are based here, as well as many news, magazine, book, and other media publishers. It is also the location of the United Nations Headquarters. Salsette Island is located in the Arabian Sea on India's west coast. The metropolis of Mumbai, the city of Thane and Mira-Bhayandar lie on this island, making it a very populous island and one of the most densely populated island in the world. It has about 15.1 million inhabitants living on an area of about 619 km² amounting to a population density of 24,414 /km2. The island has been inhabited since the Stone Age. The Kolis, a fishing community, were the earliest known settlers of the islands. The Maurya Empire gained control of the islands during the 3rd century BCE, and transformed it into a centre of Hindu and Buddhist culture and religion. The island came under the control of several successive indigenous dynasties before landing in the hands of the British in the 18th century. By that time the island, particularly the city of Mumbai (formerly Bombay), had become an important trading center. Railway viaducts and road bridges were built in the 19th century to connect Bombay Island to Salsette Island, and Salsette Island to the mainland. These railway lines encouraged wealthier merchants to build villas on Salsette Island, and by 1901 the population of this Island was 146,993, and became known as Greater Bombay. Venice in northeast Italy is situated on a group of 118 small islands separated by canals and linked by bridges. It is located in the marshy Venetian Lagoon which stretches along the shoreline between the mouths of the Po and the Piave Rivers. Venice is renowned for the beauty of its setting, its architecture and its artworks. It was a major power during the Middle Ages and Renaissance, and a staging area for the Crusades and the Battle of Lepanto, as well as a very important center of commerce and art in the 13th century up to the end of the 17th century. In 2009, there were 270,098 people residing in Venice. Joal-Fadiouth is a village at the end of the Petite Côte of Senegal, south-east of Dakar. Joal lies on the mainland, while Fadiouth, linked by a bridge, lies on an island of clam shells, which are also used in local architecture and crafts. The village has no motorised transport evidenced by the sign on entering. The major economic activities for the villagers of Fadiouth are fishing and rice cultivation. Since the town is located in a large river delta, farmers have taken advantage of the shallow flood plain caused by the river to grow rice in the area. The island is home to some 39 thousand residents according to the census of 2007. Located at the southern edge of North Malé Atoll, Malé is the capital and most populous city in the Republic of Maldives. The central island is heavily urbanized, with the built-up area taking up essentially its entire landmass. Slightly less than one third of the nation's population lives in the capital city, and the population has increased from 20,000 people in 1987 to 100,000 people in 2006. Many, if not most, Maldivians and foreign workers in Maldives find themselves in occasional short term residence on the island since it is the only entry point to the nation and the centre of all administration and bureaucracy.In recent years, the island has been considerably expanded through landfilling operations. Ebeye is the most populous island of Kwajalein Atoll in the Marshall Islands, as well as the center for Marshallese culture in the Ralik Chain of the archipelago. Settled on 80 acres (360,000 m²) of land, it has a population of more than 15,000. Over 50% of the population is estimated to be under the age of 18. Some of the residents of Ebeye are refugees or descendants of refugees from the effects of the cataclysmic 15-megaton Castle Bravo nuclear test at Bikini Atoll on March 1, 1954. The detonation unexpectedly rained nuclear fallout and two inches of radioactive snow on nearby Rongelap Atoll, which had not been evacuated as had Bikini. The 1954 American authorities then evacuated Rongelap and were returned in 1957 with extensive medical surveillance. In 1985, Greenpeace evacuated the inhabitants of Rongelap to Mejato (island in Kwajalein atoll). Ebeye was the final destination for many of them. Vasilyevsky Island is located in Saint Petersburg, Russia, bordered by the rivers Bolshaya Neva and Malaya Neva (in the delta of the Neva River) in the south and northeast, and by the Gulf of Finland in the west. Vasilyevsky Island is separated from Dekabristov Island by the Smolenka River. Together they form the territory of Vasileostrovsky District, an administrative subdivision of Saint Petersburg. The island has a population of 203,181 as of 2002. 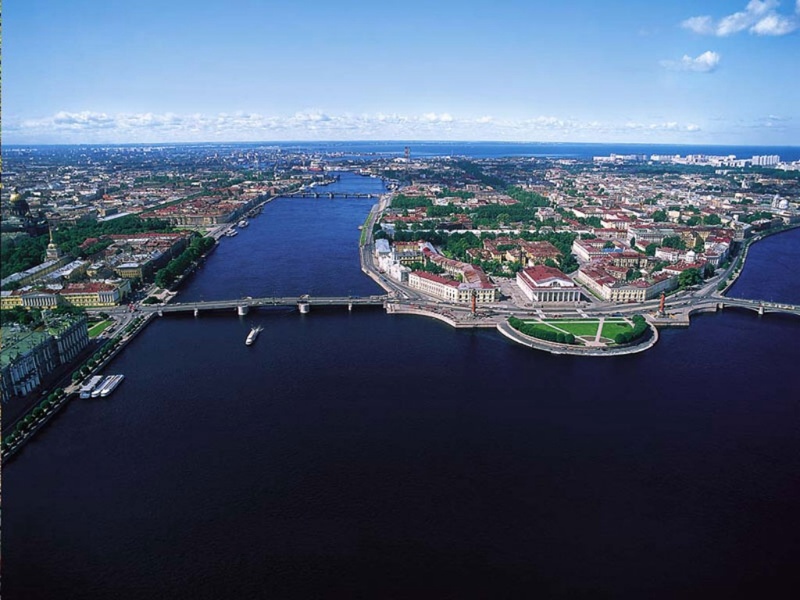 Situated just across the river from the Winter Palace, it constitutes a large portion of the city's historic center. Two of the most famous St Petersburg bridges, Palace Bridge and Blagoveshchensky Bridge, connect it with the mainland to the south. The Exchange Bridge and Tuchkov Bridge across Malaya Neva connect it with Petrogradsky Island. Vasilyevsky Island is served by Vasileostrovskaya and Primorskaya stations of Saint Petersburg Metro (Line 3 ). There are also tramway lines. Geographically, the island consists of two main parts. The south and east of the island are old, with buildings mostly from the 19th century. The southern embankment has some of the oldest buildings in the city dated from 18th century. That part of the island is notable for its rectangular grid of streets originally intended to be canals, like in Venice. Numerous museums and cathedrals makes Vasilyevsky Island a popular tourist attraction. The Hanseatic City of Lübeck is the second-largest city in Schleswig-Holstein, in northern Germany, and one of the major ports of Germany. It was for several centuries the capital of the Hanseatic League ("Queen of the Hanse") and, because of its Brick Gothic architectural heritage, is listed by UNESCO as a World Heritage Site. In 2005 it had a population of 213,983.